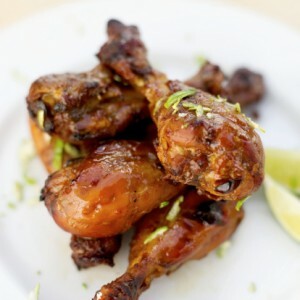 For an extra kick try these spicy chicken drum sticks for your next meal! Mix all ingredients (except chicken) in a bowl until a smooth paste forms. Then add in drum sticks and mix to coat chicken. Leave to marinate in the fridge for at least 2 hours. Preheat a grill or grilling pan to medium-high. Thread chicken onto the skewers and grill for 8-10 minutes, turning twice, until the juices run clear. While serving, drizzle with lemon juice and serve with rice.